Hello and Happy FriYAY! So I have decided to go for a fun Festival nail theme today! With another weekend of Coachella coming up I wanted to squeeze in a fun look for the occasion. That being said lets take a look at todays nails! 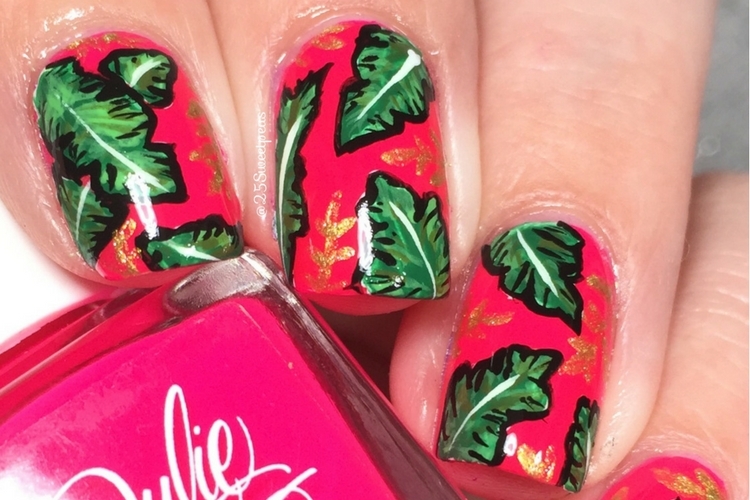 I used Oh Em Gee by Julie G which I reviewed here, earlier this week. I started the leaves with a white base since I was going to be covering up such a bold color. Then I played around with all types of greens. After that I then went in for the white down the middle. After that I used black to outline and add extra detail which in my opinion made it. Following that I still thought something was missing. Then I was thinking of the whole fashion vibe you see for Coachella type festivals I realized I was missing the jewelry part! That coming to mind gave me the idea to add some golden leaves in the background. They aren't too in your face but its enough to pull everything together and fill in the plank spaces! I am really loving this combo! Also I am really liking Gaga's new song! Along with the new COIN CD! :) Ahh good tunes! These are SO cute and fun! Honestly you did such a great job - wish I was this skilled! Thank you so so much! These were fun and time consuming for sure!